The demographics of Russia is about the demographic features of the population of the Russian Federation including population growth, population density, ethnic composition, education level, health, economic status and other aspects. As of 1 January 2017, the population of Russia is 144,498,215 excluding Crimea, whose annexation is not recognized by the overwhelming majority of the international community. Including Crimea and Sevastopol, the population was 146,804,372 on January 1, 2017. 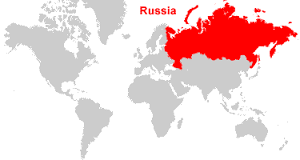 Around 77% of its population lives in European Russia, while the 23% lives in its Asian part. As of 2015, Russian TFR of 1.777 children per woman was the highest in Eastern, Southern and Central Europe. In 2013, Russia experienced the first natural population growth since 1990 at 22,700. According to the 2010 census, ethnic Russians make up 81% of the total population. This share remained steady over the last few decades. Six other ethnicities have a population exceeding 1 million – Tatars (3.9%), Ukrainians (1.4%), Bashkir (1.1%), Chuvash (1%), Chechens (1%) and Armenians (0.9%). In total, 160 different ethnic groups live within the Russian Federation's borders. Russia's population density is 8.4 people per square kilometre (22 per square mile), making it one of the most sparsely populated countries in the world. The population is most dense in the European part of the country, with milder climate, centering on Moscow and Saint Petersburg. 74% of the population is urban, making Russia a highly urbanized country. source: wikipedia.org and other media reports.